The state flag of New South Wales was adopted in 1876, and is an adaptation of the national flag of Australia. The flag features a golden lion passant guardant with four eight-pointed golden stars within the cross of St. George, on a white disc. 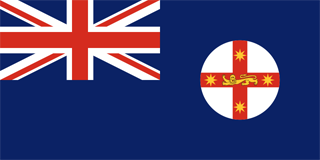 The official coat of arms of New South Wales was granted by a Royal Warrant of King Edward VII on October 11, 1906.